The recent crisis in the financial markets has exposed serious flaws in management methods. The failure to anticipate and deal with the consequences of the unfolding collapse has starkly illustrated what many leaders and managers in business have known for years; in most organizations, the process of forecasting is badly broken. For that reason, forecasting business performance tops the list of concerns for CFO's across the globe. It is time to rethink the way businesses organize and run forecasting processes and how they use the insights that they provide to navigate through these turbulent times. This book synthesizes and structures findings from a range of disciplines and over 60 years of the authors combined practical experience. This is presented in the form of a set of simple strategies that any organization can use to master the process of forecasting. The key message of this book is that while no mortal can predict the future, you can take the steps to be ready for it. ’Good enough’ forecasts, wise preparation and the capability to take timely action, will help your organization to create its own future. 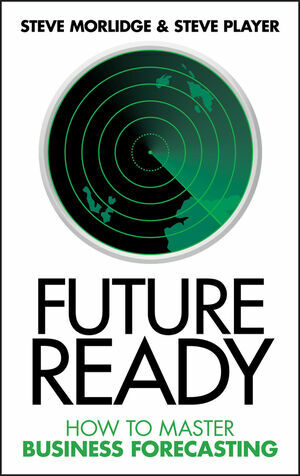 Future Ready is an invaluable guide for practicing managers and a source of insight and inspiration to leaders looking for better ways of doing things and to students of the science and craft of management. "Will make a difference to the way you think about forecasting going forward"
"Great analogies and stories are combined with rock solid theory in a language that even the most reading-averse manager will love from page one"
"A timely addition to the growing research on management planning and performance measurement." "In the area of Forecasting, it is the best book in the market." Steve Player founder and managing director of The Player Group, has co-authored and edited five industry-leading cost and performance management books. He is program director for the Beyond Budgeting Round Table in North America. He served as the Managing Partner of the Advanced Cost Management Team of a global accounting firm. He is a top ranked speaker and consultant helping clients implement leading edge practices. he also writes a monthly column on Finance Transformation. Chapter 1 Part 1 Why Change? Everyone Knows the Trouble I've Seen. Chapter 1 Part 2 Forecasting Disease, the Symptoms and the Remedy. Chapter 2 Mastering Purpose – the Cassandra Paradox. Chapter 3 Mastering Time – Delay and Decision. Chapter 4 Mastering Models: Mapping the Future. Chapter 5 Mastering Measurement – Learning to Love Error. Chapter 6 Mastering Risks: How the Paranoid Survive. Chapter 7 Mastering Process: The Mother of Good Fortune. Theme #1 Recipe for success: tips and traps. Theme #2 Coordination in a complex system: how different can we be? Theme #3 Whose job is it anyway? Roles and responsibilities. Chapter 8 Implementation: Beginnings and Endings. Chapter 9 Beyond Forecasting: The Biggest Barrier. Chapter 10 Beyond Budgeting: A New Management Model? Appendix 1 – Design Principles: A Summary. Appendix 2 – Important Concepts in Systems and Cybernetics.